Five Tuition provides after-school and weekend tutoring to students from Foundation to Year 12. Students receive private tuition tailored to their individual needs, sharing a tutor with up to four other students. 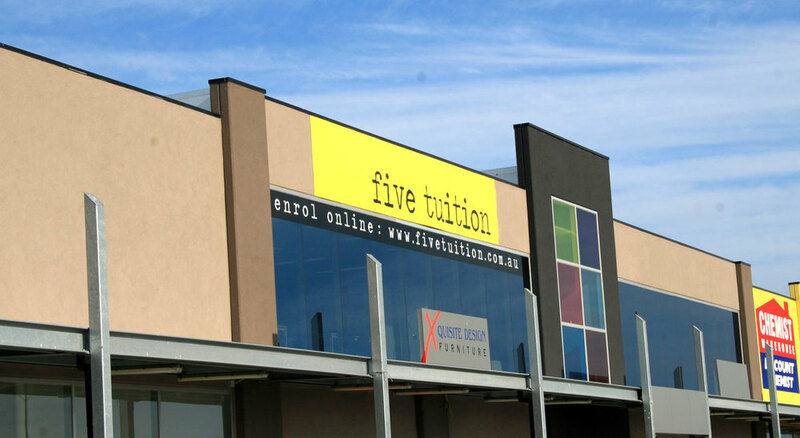 Five Tuition is locally born and operates in three venus located in Melbourne's western suburbs. Five recruits some of the brightest University students in Melbourne's west who have attained exceptional VCE scores, and have a passion to share their knowledge and experience with younger students. All of our tutors are employees of Five Tuition and have passed a Working with Children Check. How much does five cost? Our standard rate is $45 per 2-hour weekly session, paid on a per-term basis. Students typically attend on the same day and time each week, but students can also attend 'once-off' sessions. We accept new enrolments at any time of the year. Our first campus, located across from McDonalds and Coles. Located inside Point Cook Town Centre, across from Westpac bank. Located within Caroline Springs Anglican church, across from McDonalds. You can enrol at any of our campuses, or online by clicking on the button below.